Nautical by Nature: Starting 2009 off right! Belted cardigan with anchor pockets! Might have to go make the trip to try some of it on, though! aren't you just the luckiest girl ever with all of the clothes that are going to come out! I love these looks--especially Old Navy and Stella McCartney! All so cute!!! I can't wait for the warmer weather!!! I LOVE the Stella McCartney this season!!! The Anchor Sweater, Fabulous!! All these anchors are making me think of spring! I have that shirt from Forever21. Forewarning, it runs UBER small. I usually wear a small and needed a LARGE. I got this email and was stoked. Love the nautiucal look, can't wait to go pick up some great stuff for spring! That is darling! I love the nautical look - always have!! I'm a big Old Navy fan, I can't wait to head over there after reading your post! My email's apreppygirlmeetsworld@gmail.com !! Can't wait to hear all the details, hopefully I can make it! That Stella McCartney sweater is gorgeous! oh I LOVE that old navy t! Hi Kate...check out llbean accessories and they have a super cute scarf with anchor on it. I immediately thought of you! Stay warm. 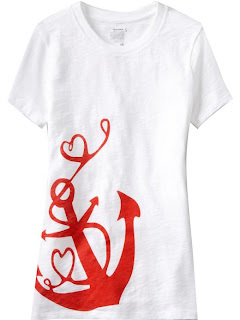 Did you see the anchor socks with hearts at Old Navy. It's like the fashion world read your mind! I'm so excited for all this nautical clothing! etsy has some really cute anchor items, these earrings being one of them!! You are just too far ahead of your time! I love the O.N. stuff!